systems at that time. And the complexity has been growing day after day. 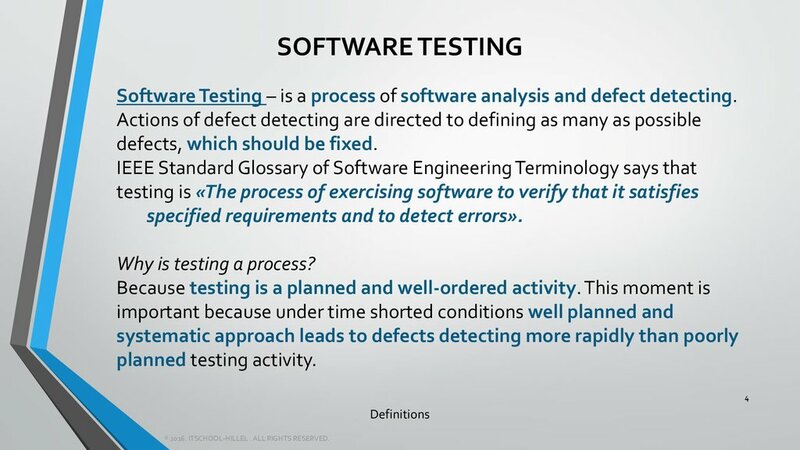 Software Testing – is a process of software analysis and defect detecting. 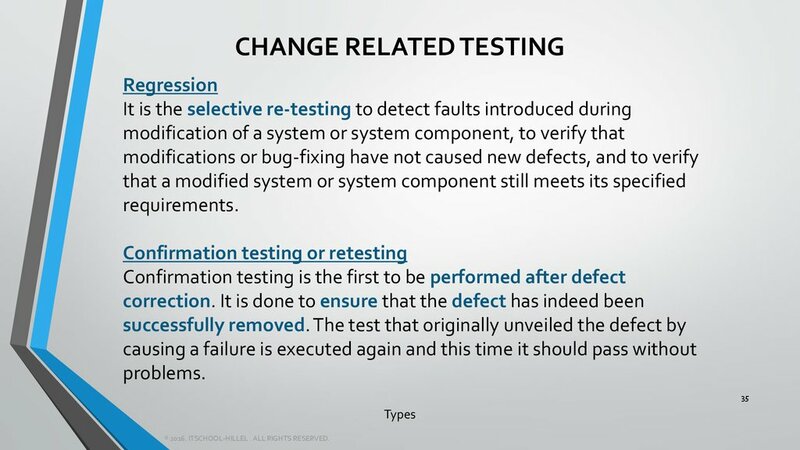 defects, which should be fixed. 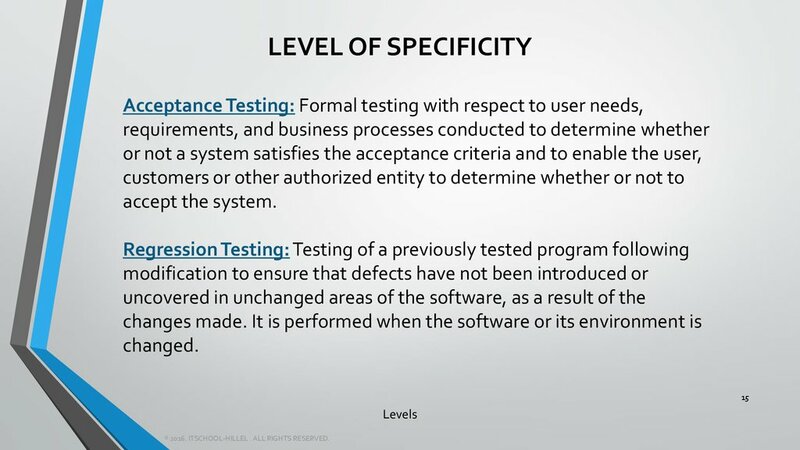 specified requirements and to detect errors». 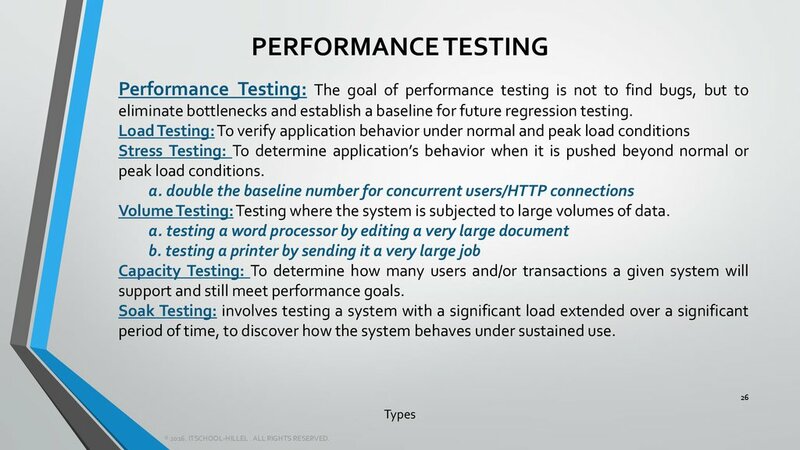 Why is testing a process? of our actions (inputs). 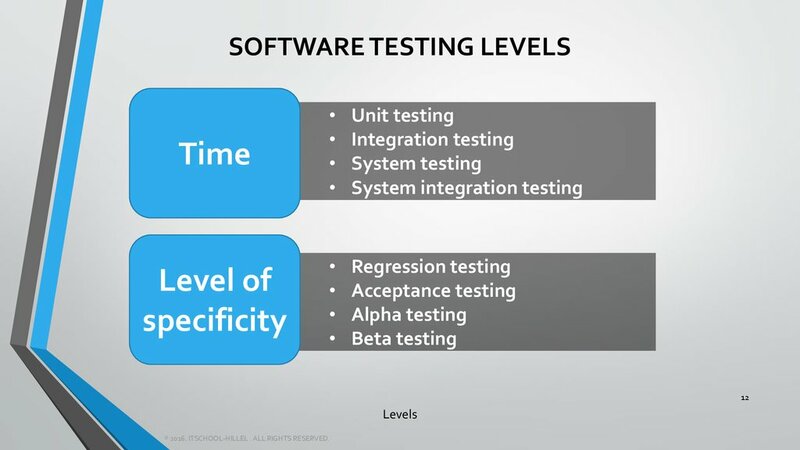 In other words – this is correct behavior of the software product. we have found the defect. 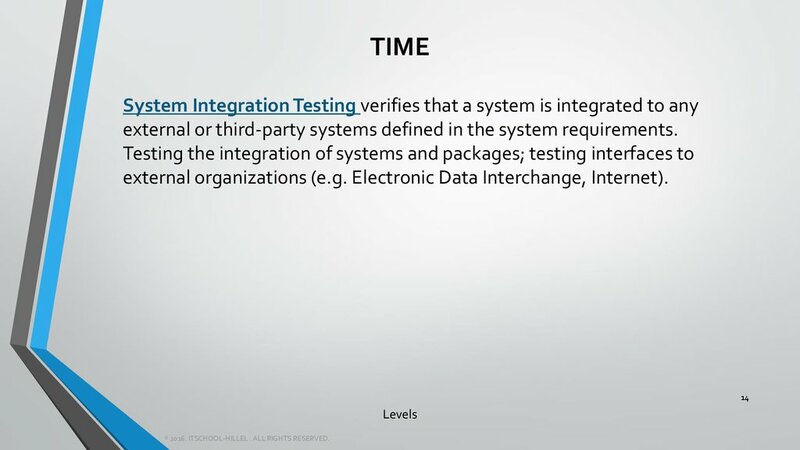 path or to verify compliance with a specific requirement. 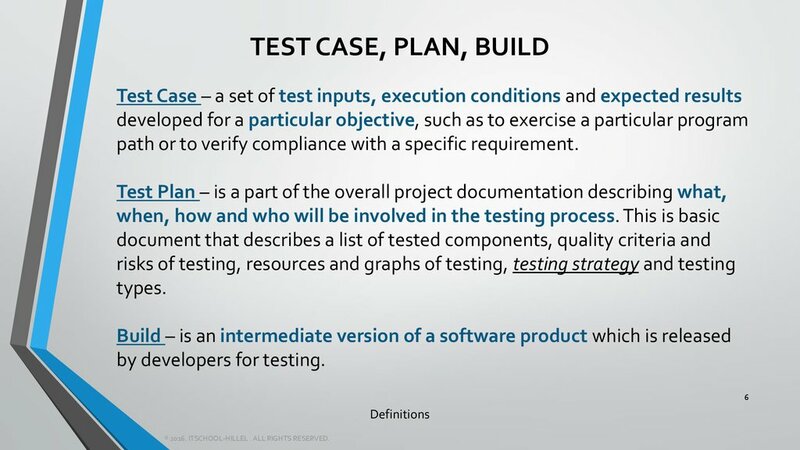 o Project plan, Test plan. 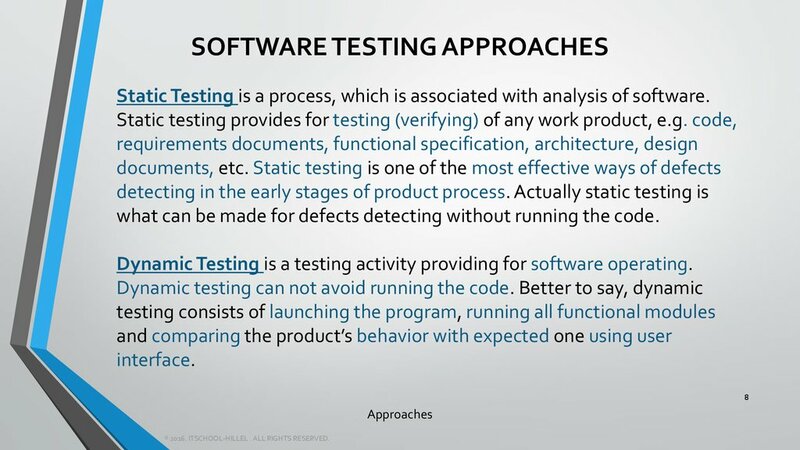 Static Testing is a process, which is associated with analysis of software. what can be made for defects detecting without running the code. 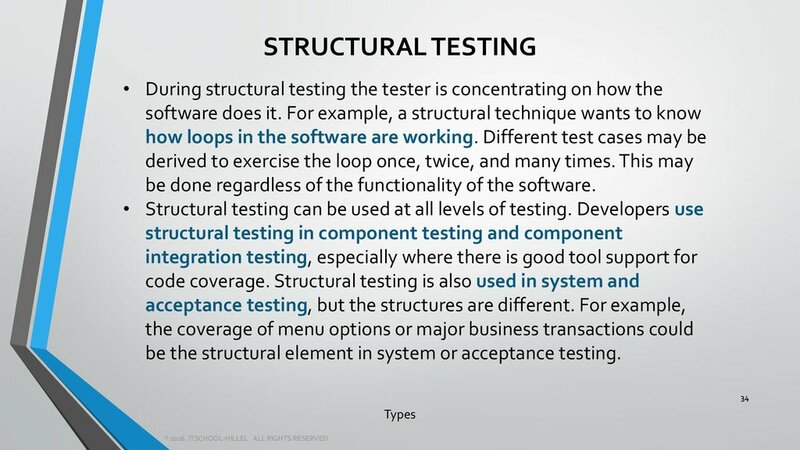 Dynamic Testing is a testing activity providing for software operating. 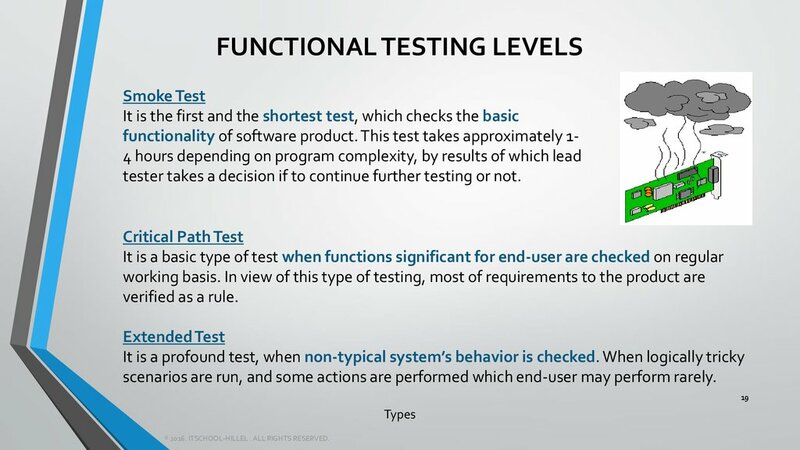 verify whether all functions correspond to functional requirements. 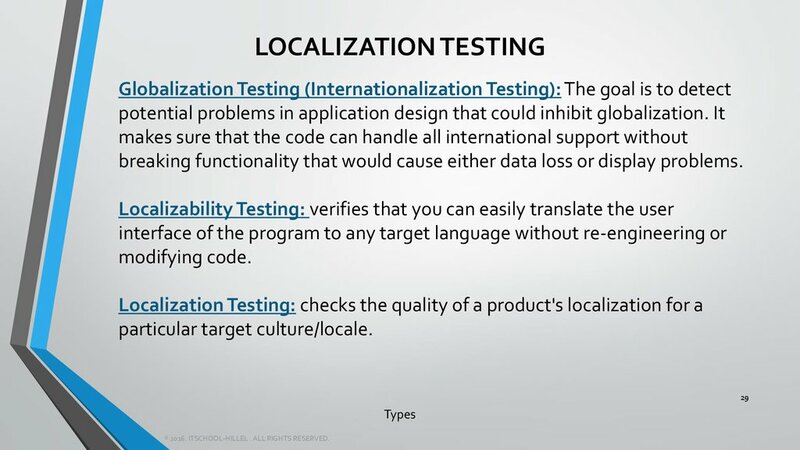 already run the same test cases. understands the logic of code. • Bug diagnosis can be done quickly. – some «typical» bugs can be missed. 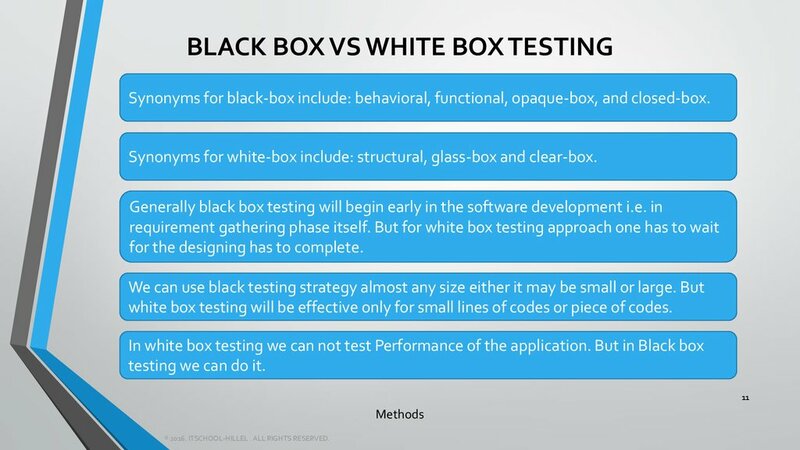 Synonyms for black-box include: behavioral, functional, opaque-box, and closed-box. Synonyms for white-box include: structural, glass-box and clear-box. for the designing has to complete. 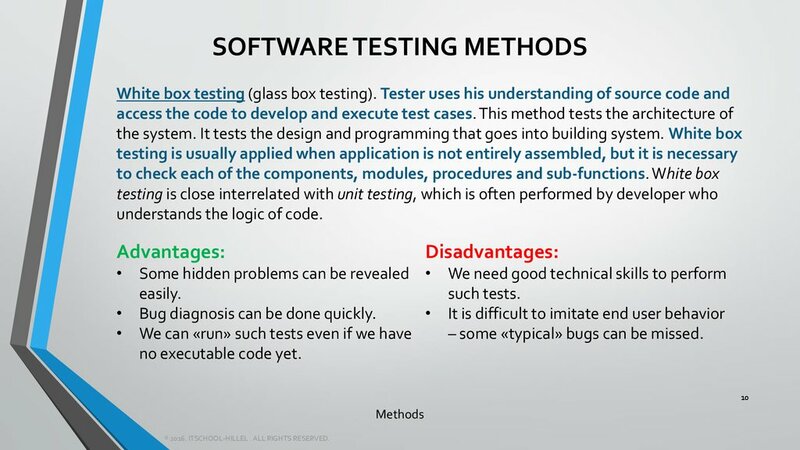 white box testing will be effective only for small lines of codes or piece of codes. testing we can do it. the system. 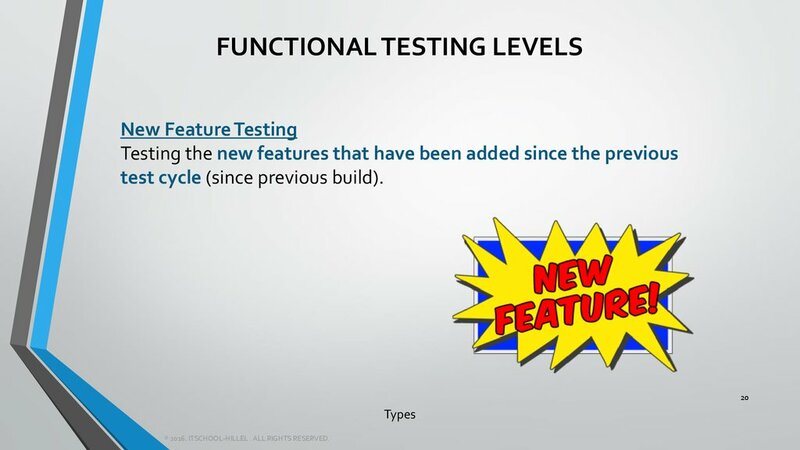 It may be a testing even of any particular part of the code (class). 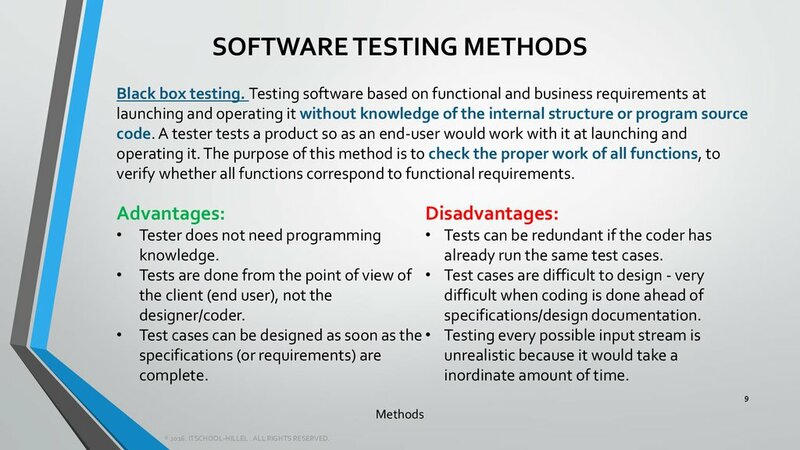 be checked within this type of testing. In this case this testing is known as Crossproduct testing. 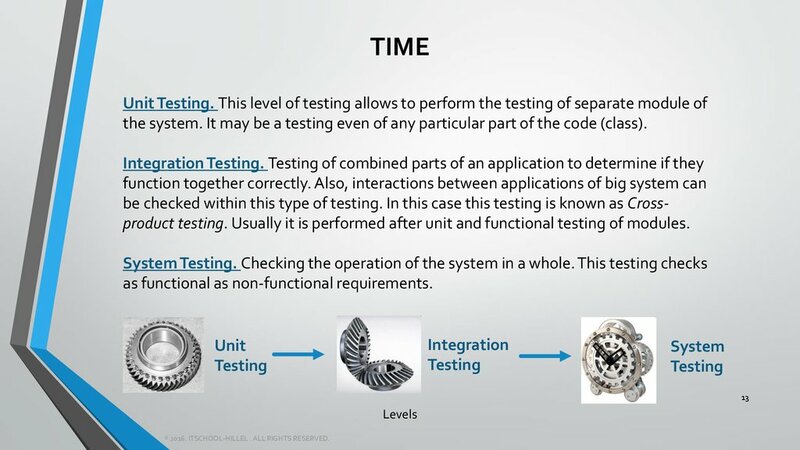 Usually it is performed after unit and functional testing of modules. 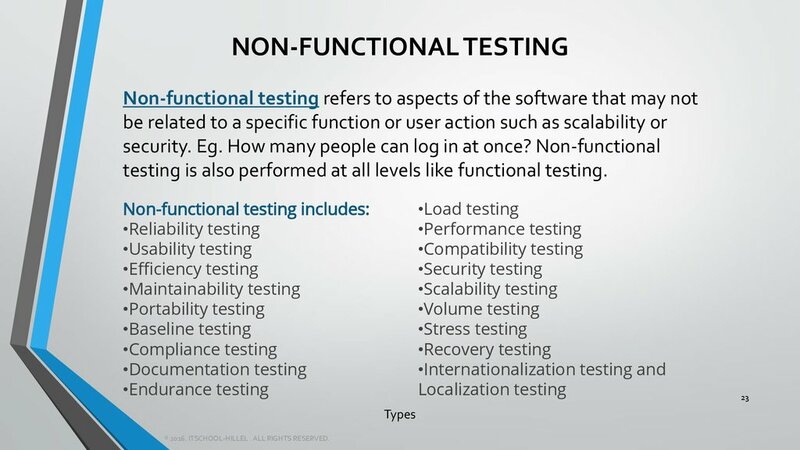 as functional as non-functional requirements. 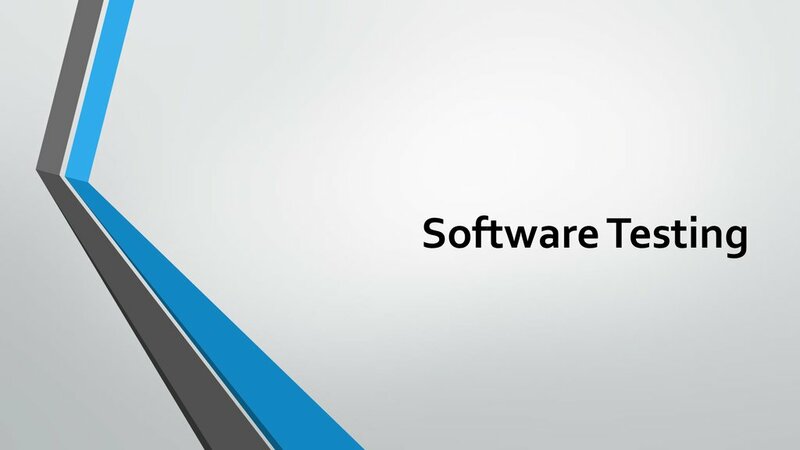 external or third-party systems defined in the system requirements. external organizations (e.g. Electronic Data Interchange, Internet). 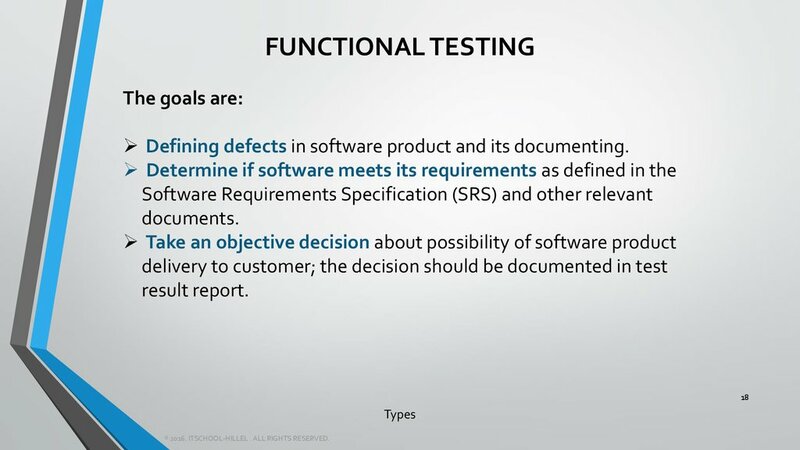 between the program and its functional requirements or specifications. 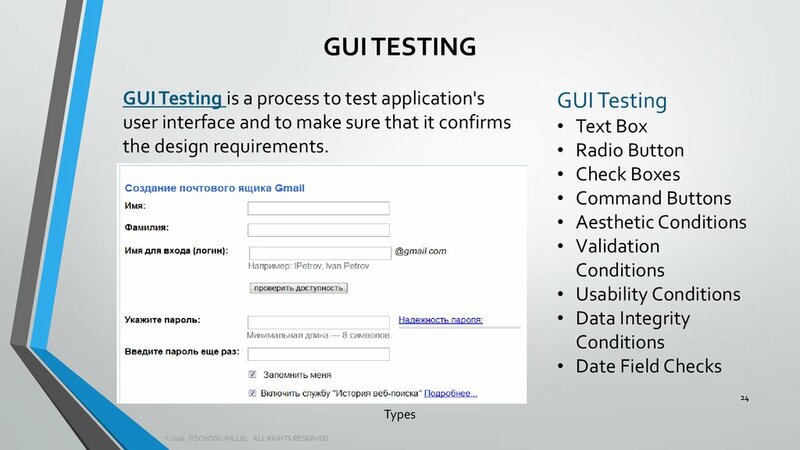 using specific tools (automated testing). 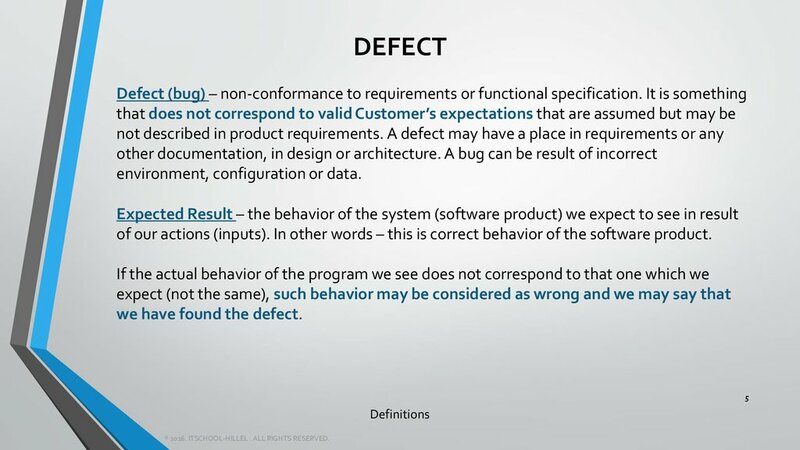 Defining defects in software product and its documenting. tester takes a decision if to continue further testing or not. 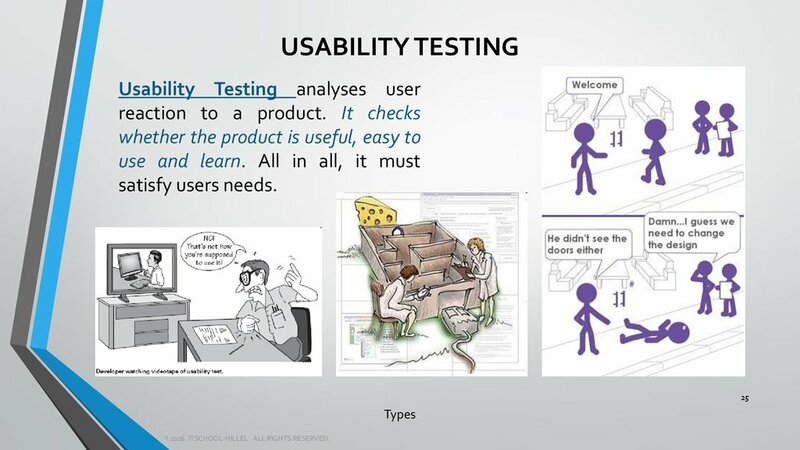 scenarios are run, and some actions are performed which end-user may perform rarely. test cycle (since previous build). environment and conditions. If it fails – things are bad. 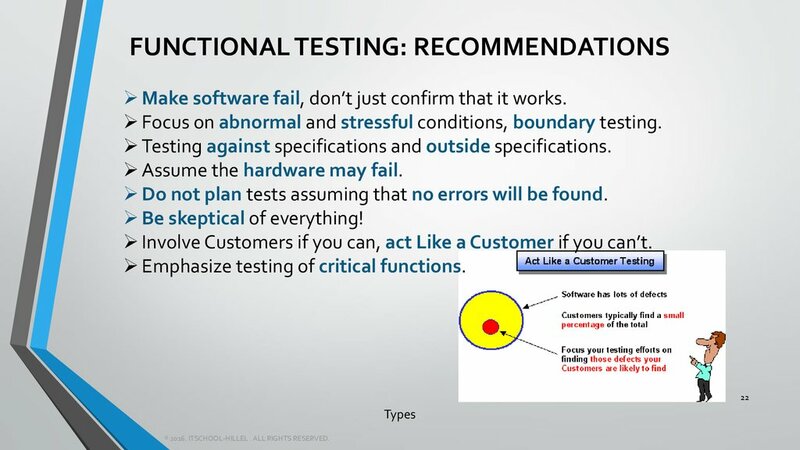 Make software fail, don’t just confirm that it works. Focus on abnormal and stressful conditions, boundary testing. 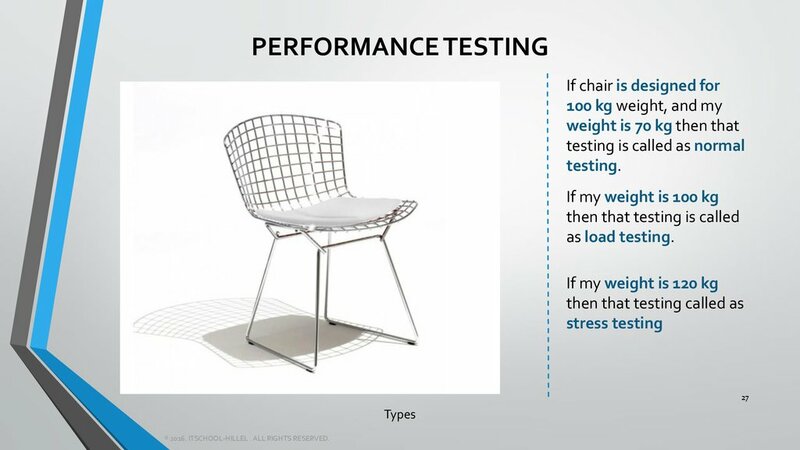 Testing against specifications and outside specifications. Assume the hardware may fail. 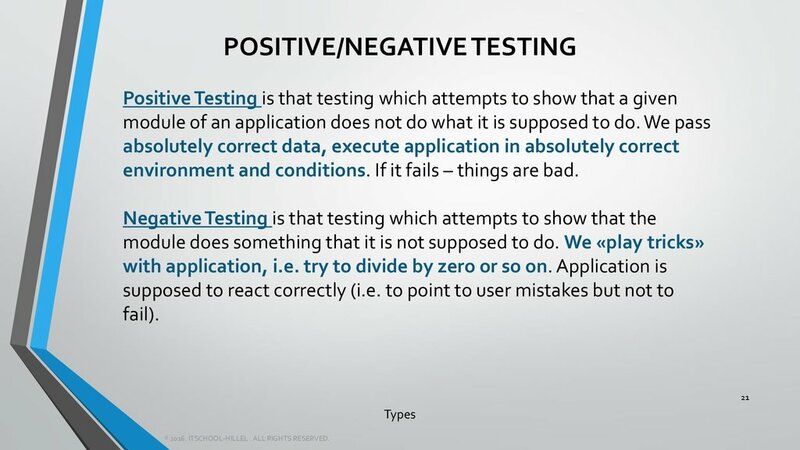 Do not plan tests assuming that no errors will be found. Involve Customers if you can, act Like a Customer if you can’t. 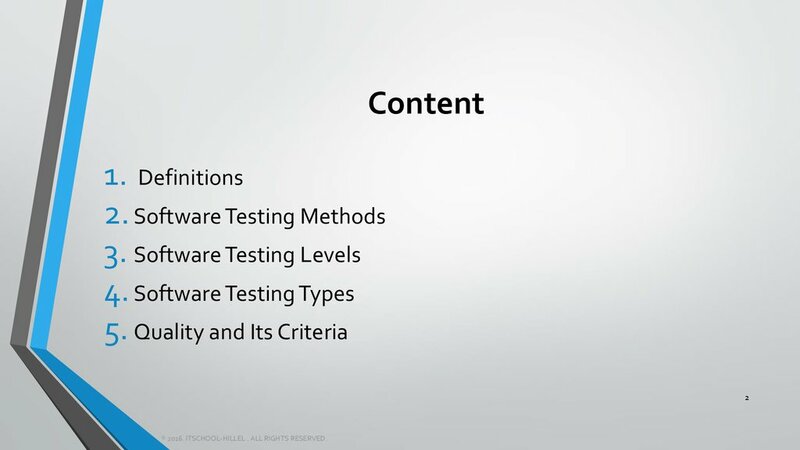 Emphasize testing of critical functions. 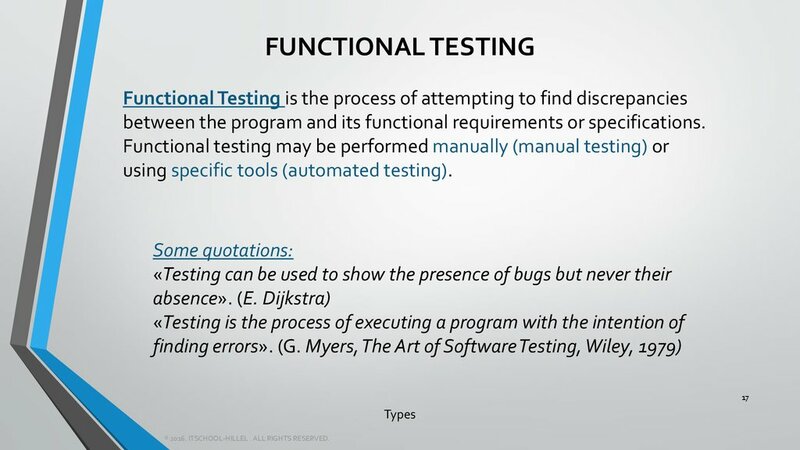 testing is also performed at all levels like functional testing. 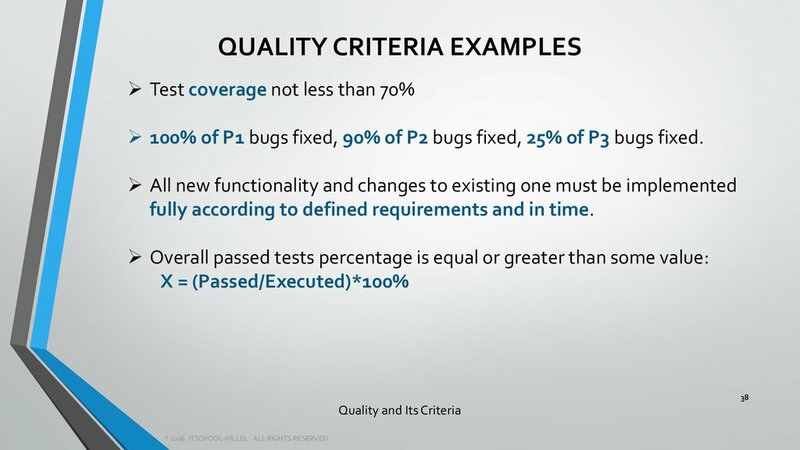 eliminate bottlenecks and establish a baseline for future regression testing. support and still meet performance goals. period of time, to discover how the system behaves under sustained use. target execution system when installed and executed on the target system. 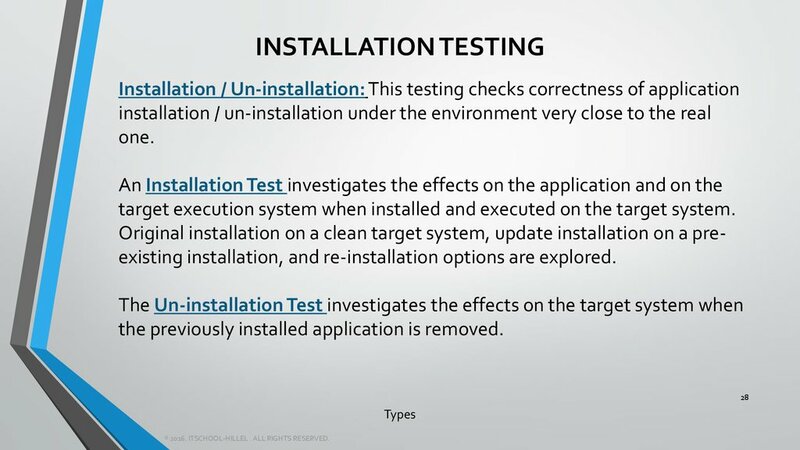 Original installation on a clean target system, update installation on a preexisting installation, and re-installation options are explored. the previously installed application is removed. breaking functionality that would cause either data loss or display problems. 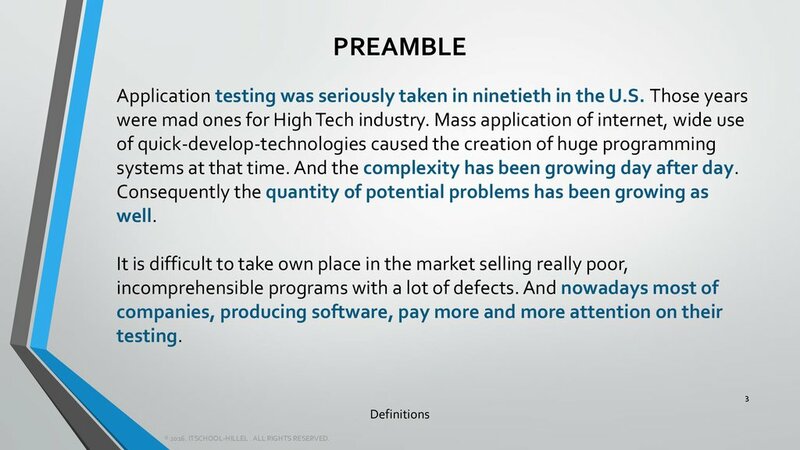 define a product’s interaction with hardware and software environment. Products’ reaction to different settings can be checked as well. 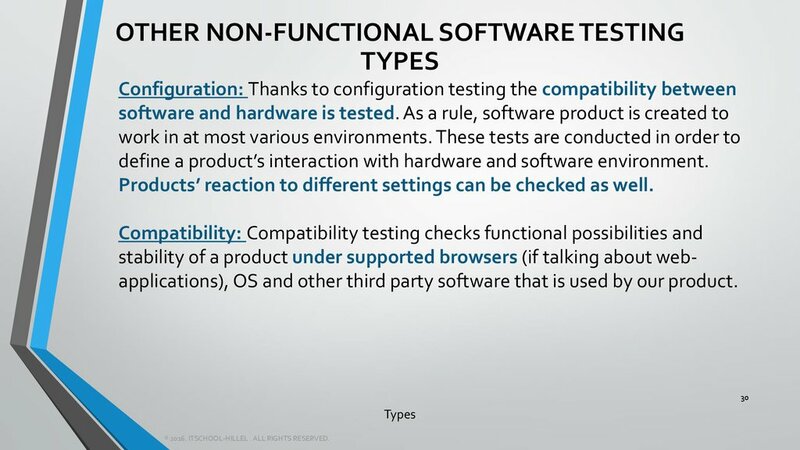 stability of a product under supported browsers (if talking about webapplications), OS and other third party software that is used by our product. recover from crashes, hardware failures and other similar problems. afterwards check the validness of the application's data integrity. Restart the system while a browser has a definite number of sessions. 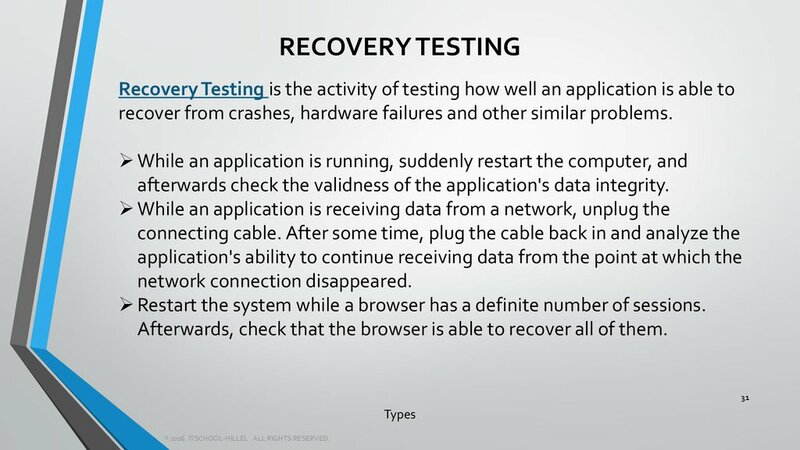 Afterwards, check that the browser is able to recover all of them. 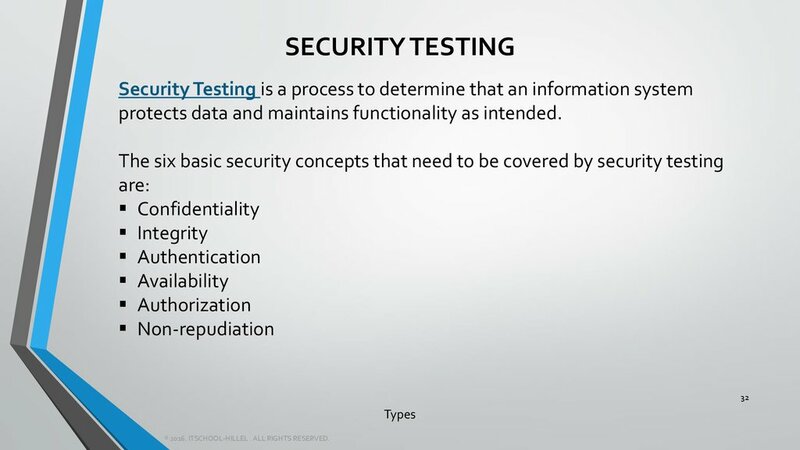 protects data and maintains functionality as intended. what is happening ‘inside the system/application’. be done regardless of the functionality of the software. 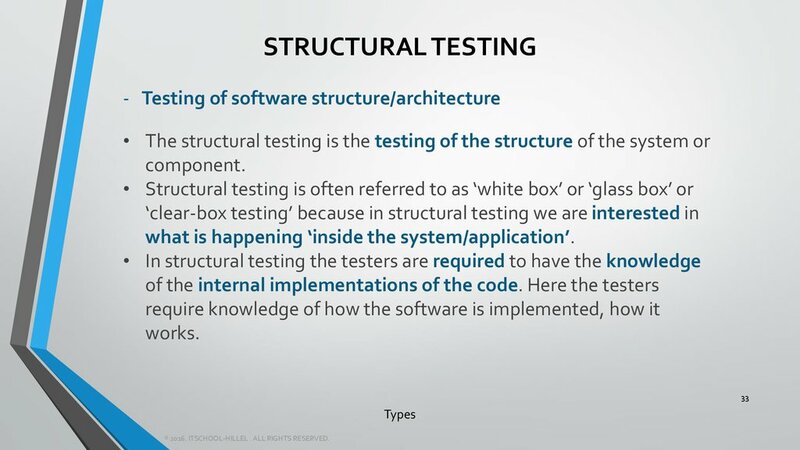 be the structural element in system or acceptance testing. 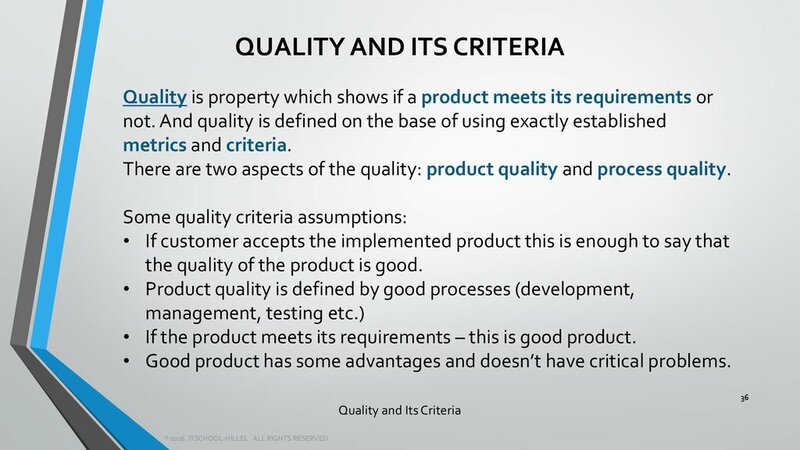 There are two aspects of the quality: product quality and process quality. 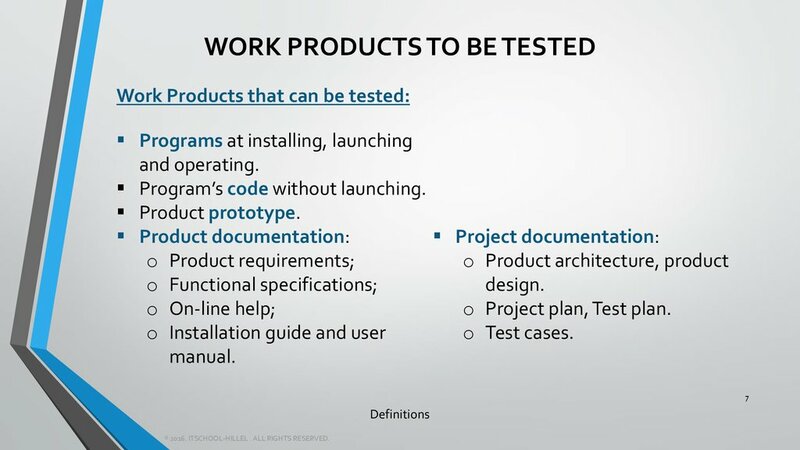 • If the product meets its requirements – this is good product. • Good product has some advantages and doesn’t have critical problems. 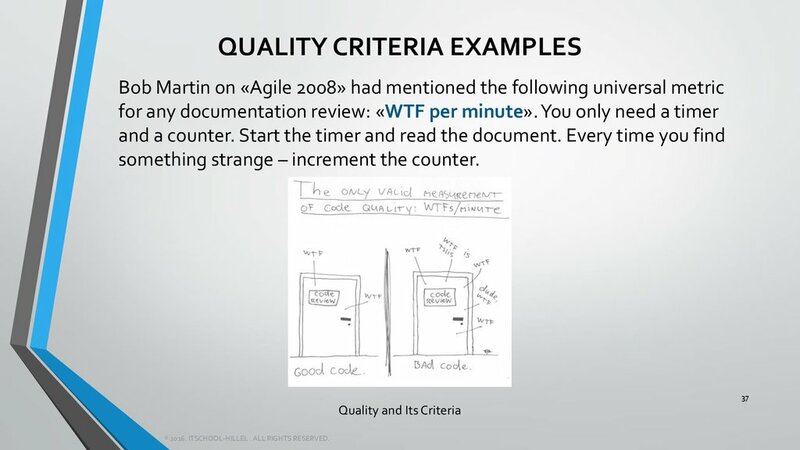 something strange – increment the counter. 100% of P1 bugs fixed, 90% of P2 bugs fixed, 25% of P3 bugs fixed. 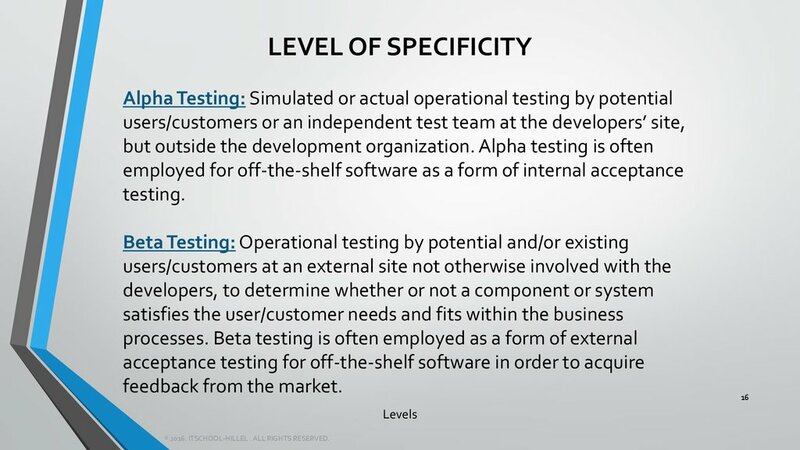 fully according to defined requirements and in time.